Engineers have sent proton particles all the way round the Large Hadron Collider (LHC) machine for the first time in more than a year. But they still do not have a stable circulating beam; this step is expected to happen after 0600 GMT on Saturday. The LHC is housed in a 27km-long circular tunnel some 100m beneath the French-Swiss border. It will smash together beams of protons in a bid to shed light on the nature of the Universe. 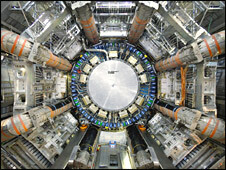 The LHC has been shut down for repairs since an accident in September 2008. Operated by the European Organization for Nuclear Research (Cern), the LHC will create similar conditions to those which were present moments after the Big Bang. 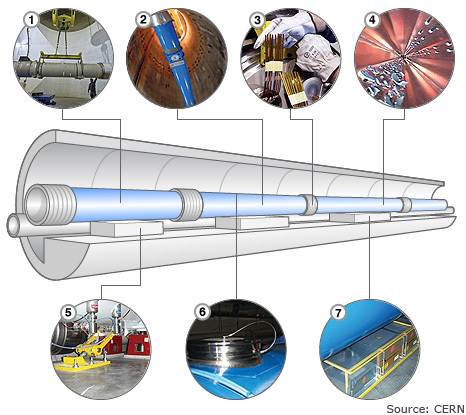 There are some 1,200 "superconducting" magnets arranged end-to-end in the underground tunnel. These magnets bend proton beams in opposite directions around the main "ring" at close to the speed of light. At allotted points around the tunnel, the proton beams cross paths, smashing into one another with enormous energy. Scientists will scour the wreckage of the collisions for discoveries that should extend our knowledge of physics. On Friday evening, engineers sent a beam around the LHC's 27km-long ring for the first time since September 2008. Engineers are expected to continue sending protons around the collider overnight. The beams themselves are made up of "packets" - each about a metre long - containing billions of protons. The protons would disperse if left to their own devices. So once beams are circling the LHC, they have to be stabilised. This involves using electrical forces to "capture" the protons, keeping them tightly huddled in packets. The LHC was designed to run at energies of seven trillion electron volts. But the machine will clash together protons at energies of just 3.5 trillion electron volts (TeV) in its first few months of operation. "To get to 3.5 (TeV) is fantastic, because that is further than we have ever looked before," said Dr Tara Shears, a physicist at the University of Liverpool, UK, who will be studying data from the LHC. "We have no idea where the chinks in our understanding of the Universe are going to become apparent. Anything which lets us see further than we have already is immensely valuable." 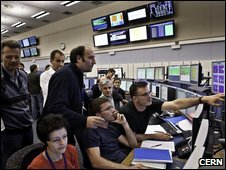 To much fanfare, engineers first circulated a beam all the way around the LHC on 10 September 2008. But just nine days later, an electrical fault in one of the connections between superconducting magnets caused a tonne of liquid helium to leak into the tunnel. Liquid helium is used to cool the LHC to its operating temperature of 1.9 kelvin (-271C; -456F). The machine has been shut down ever since the accident, to allow repairs to take place. The damage caused to the collider meant 53 superconducting magnets had to be replaced and about 200 electrical connections repaired. Engineers have also been installing a new early warning system which could prevent incidents of the kind which shut down the experiment. Cern has spent some 40m Swiss Francs (£24m) on repairs to the collider.